The Warrior: We will hold the space for you to safely explore that which you have been hiding from yourselves, but we cannot force you to do so. We will hold the space for you. Inside you have a place within you that looks dark, that’s black, perhaps. We see it here. Do you see us? Here. That space. Right there. Hold that space within you, allow yourself to know this space and know the truth of you and know the truth of the lies you’ve told, the truth of the hiding you’ve done and allow yourself to bring this truth to your knowingness. Now it’s here between, it’s here between what? Between your heart and your head. Why? Because you have not yet loved it and you are afraid to think of it. It lodges there. It lodges there. Keep aware! Aware now. Don’t go into questions. Tonight we just want to open the door to that truth. Open the door to the lie. Open the door to the part of you that you have been unwilling to know. It’s here. It hides here. Right here. Right here. And when we get done, not today but soon enough, it won’t hide here anymore. And when this space is cleared, this gives you the opportunity to create in a brand-new, brand-new way. Brand-new way. We are here to hold the space. Do you understand? We are not here to dialogue with you necessarily. We are not here to answer questions. We are not here to do it for you. We are not here for those reasons. We are here to reach inside of you, open it up, and let you see what’s there; and then the Council supports you in letting it heal. Letting it transform. Our role is that we are not afraid of any of it. Hear us now. You cannot show us anything that creates fear within us. So when it creates fear within you we invite you to allow our energy to permeate the space and to stand beside you without fear. We don’t even experience courage. We experience the absence of the possibility of fear. And we hold you in that truth. We hold you in the truth that says there is no fear here. What there is is the willingness to tell yourself the truth. You will hold the truth in this space if you stand with us and we will not leave you alone in that space for it would be a lack of courage act and that is impossible for us to do. We will hold with you, we will hold with you, as you are able to experience and express yourself in this new way. We come to this place with you because it is time for this to transform. You can no longer store things in this space. You are ready to free yourself of this hidden chamber of shame. We will hold there with you. You cannot shock us. You cannot startle us. You cannot create shame, embarrassment, fear, anxiety in us. It does not exist. We exist outside of the emotional realm you encounter. This does not make us robotic or anything like that that you experience of a non-emotional being on your planet. What it makes us is able to stand in non-judgment, non-duality, and hold the truth of you regardless of the acts you have committed. Regardless of the thoughts you have had. Regardless of the urges of the body. We are able to stand in the place that holds who you truly are aside from the judgments and dualities that your physical lives have lumped on to the truth of you. And as you shed those things, you free yourself for the opportunity to stand the way we stand. We invite you to join us in this stance. And we will stand next to you here so you have the example. We stand next to you. They call us the Warrior primarily because we are willing to face anything. Not for love of country or any of the things that previously you may have experienced warrior energy around. But for the revelation of truth. The revelation of the completeness of you experiencing the human form and the revelation of you knowing who you are while in a body. You’re ready for it. And we are standing next to you as you reach out and reclaim yourself from the way it has had to be in order to experience humanity up until this point. There is a door now open that has not been open to you before, and you do not walk through it alone. As you go to sleep tonight we invite you to place a hand or both hands here on this part of your body, higher, lower, we don’t care, you know where it is, you’ve been doing this long enough and we invite you to say: “I am ready.” You’ve already acknowledged your willingness. We invite you to acknowledge your readiness because those are two far, far different things. Anyone can be willing but it requires someone with courage to be ready. “I am ready.” And you will not walk alone. And you will have tools. You had been well prepared for this experience and we invite you to use them readily. Now, for now we must go, but we only use the word go in the sense that we are going to allow Veronica’s energy to be experienced by another to help you. But we do not go far and you will know us more. You are not alone and we walk right next to you and we carry all the tools so that you may have them handy as you need them. And we stand next to you in the knowing of the truth and the knowing of the complete story and we are neither shocked nor dismayed. You have never been in the presence of a being that can hold the stance of non-judgment the way we can, for that is the strength we bring to this Council. And we invite you to give yourself the love that is requires to stand in non-judgment right with us about yourself and your alternative expressions. There will be more. For now we say goodbye, but we don’t go far. Warrior: We’re supposed to talk about our chakra, first. The way we see it is this idea that we’re standing on a promontory and we’re just looking out, seeing what there is to be seen, observing, being aware, knowing. 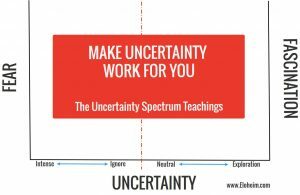 Knowing where things are, knowing where things are likely to come from, having a sense of what people are like, what they like, what they don’t like, what they do, what they don’t do, having an awareness of your surroundings, having an awareness of spatial arrangement. There is also a sense of being perceptive, and by perceptive we mean connecting the dots. Not just knowing: OK, this is here and this is here and this is here. But if this is here then likely it is that, this, that, and the other thing probably occurred. Being perceptive. Being able to put together information in an organized way to draw conclusions from. Seeing the truth of matters. It’s kind of straightforward, actually. It’s a very straightforward chakra, in the sense that it doesn’t have a lot of nuance to it. It is the perception, the perceiving, the observing, the awareness, being aware. Now, a lot of people get kind of mystical about this as, well, the idea of seeing inward as well as seeing outward. Being observant of your inner truth. Being observant of your inner journey. Being observant of your inner knowing, is also an aspect of this. Observing your inner world, observing your outer world, and observing how they interact with each other and then running it through the other chakras for how you want to decide what to do with that. How will you express about it? How can you love yourself with that information? How can you create in the world from there? How can you allow the world in with that information, and how can you feel rooted and grounded into the body and into duality with it? It’s a perceptive place. It’s a way of you examining the world. The lower chakras, of course, it comes in and it goes out; but this chakra is you examining the world, you examining your inner experience around those subjects, and then working it through the rest of the system. And when we tell our story, our story has a lot of detail and it tells you all kinds of interesting things about how people act and how people are and what they care about and what they don’t care about and how they react and how they perceive. And as Veronica has shared with you, when she works with the Council we are the only one who shows her a movie while she’s working with us. And now you can see that perception. So, a movie with our chakra makes the most sense. Plus, we have the best scenery. We have castles and things, and three-headed dogs. Who else has that? Nobody. Perception. Awareness. It’s also a responsibility to be alert for the places where you’re trying to hide from yourself, alert to the places where you are avoiding, alert to the places where you’ve let the past creep in, alert to the places where you are jumping into the future. That’s the chakra where that past/future thing that we’ve talked about many times, that’s the chakra where that’s processed, as well. OK? It’s very straightforward. We don’t have anything else to say about it. It’s just what it is. And because we’re being perceptive, we recognize that to go into our story tonight would be an unkindness to Veronica and her system, so we’ll hold the story until next week, because this week was really about the Council speaking to you as a team about how you can work with us as a team. But we have plenty of story coming. Don’t you worry. Don’t go into lack. There’s lots of story to come. And yes, we are still smitten. Don’t you worry. More next week. Good night. There’s so much power in The Journey of Consciousness. I found myself sometimes taking in really deep sighs for minutes (it’s maybe not the right English way of saying it, but hopefully you get it anyway). Deep inhalations and exhalations, releasing old energy, taking in new energy WHILE reading, and all of that unconsciously (until of course I got conscious of the fact that my body was doing this breathing-thing). This is a great book for all ages, genders, and cultures. The narrative brings the Warrior to life as he talks to you in person about how you can meet your inner foe and do away with it. The inner foe has kept you small, fearful, or less than your potential. 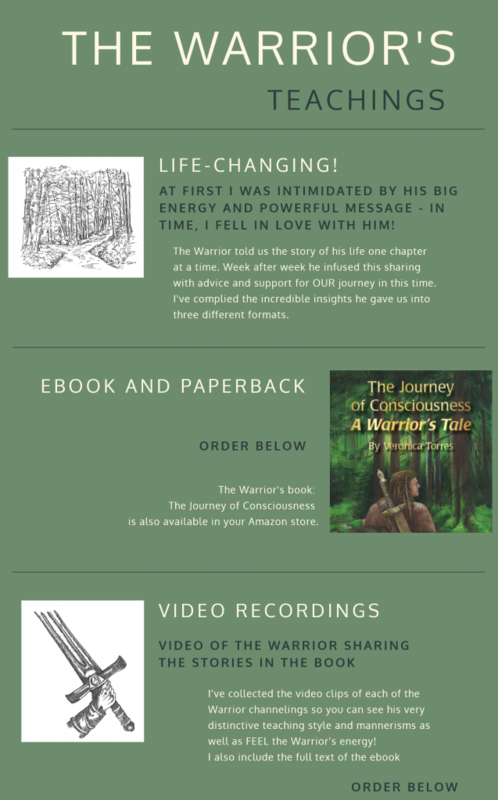 If you want to read a story of how the warrior lived in times past, and learn about yourself at the same time, this book is for you. If you want to activate the warrior energy to help you release acting like a victim, this is the book for you. The Warrior will walk with you and give you strength in your need and entertain you at the same time. I love this book and I love the Warrior. The videos are hosted here on my site. I will email you a username and password within 24 hours of purchase. The email will also include full instructions on how to use those credentials to access the written and recorded versions of the Warrior’s messages. 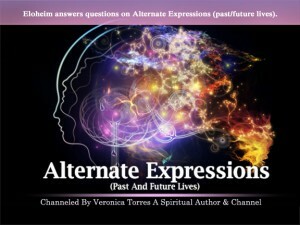 Your purchase will include the mobi, epub, and pdf versions of the book.